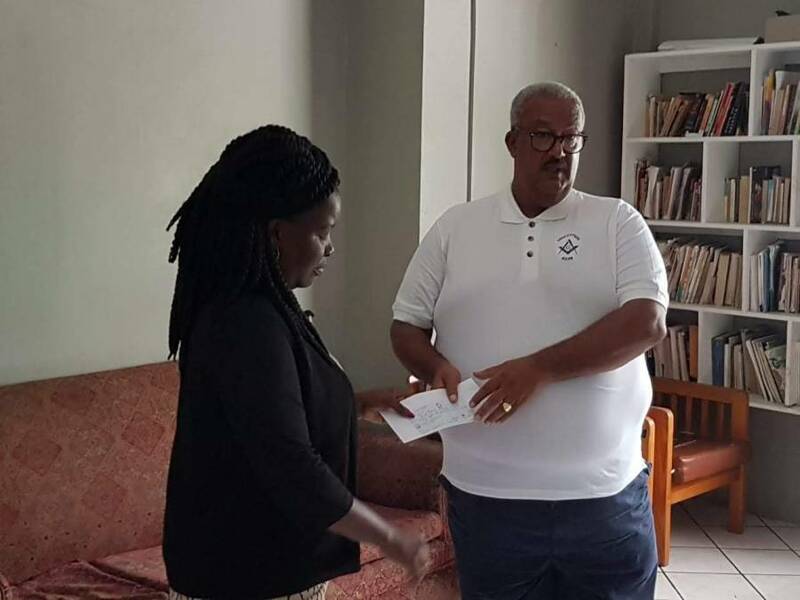 Christopher Comissiong, Worshipful Master of Conception Lodge 8346 presented an EC$5,800 cheque to Ingrid Lashington, Home Manager of Father Mallaghan’s Home for Boys, at Richmond Hill, in the presence of staff of the Child Protection Agency (CPA), the governing body for the home. Lodge members present included Dr Lutz Amechi, Wayne Francis, and Colin Dowe. Upholding the 3 sacred tenets of Freemasonry: Brotherly Love, Relief and Truth, Conception Lodge 8346 EC (English Constitution) pledged to assist 3 students at the boys’ home who were successful in the 2018 CPEA Exams. A 13-year old will be attending Wesley College; and 2 12-year-olds will be attending Boca Secondary school. The commitment is to support the boys throughout their 5-year tenures at secondary school, with each receiving a minimum of $1,200 annually. Charity is a major part of Freemasonry and in 2014, Conception Lodge adopted the home as its specifically-targeted charitable endeavour in Grenada, to give financial support and provide mentorship to the boys. To date, the lodge has donated close to $10,000 to the home. Also of interest to Conception Lodge are 2 other boys who secured passes in the school leaving examinations and will be attending Happy Hill Secondary School and JW Fletcher respectively. Constituted in 1971 by a Charter from the United Grand Lodge of England, Conception Lodge one of three Craft Lodges in Grenada. Others are Lodge St George No. 3072 and Lodge St Andrew No. 1794 SC.